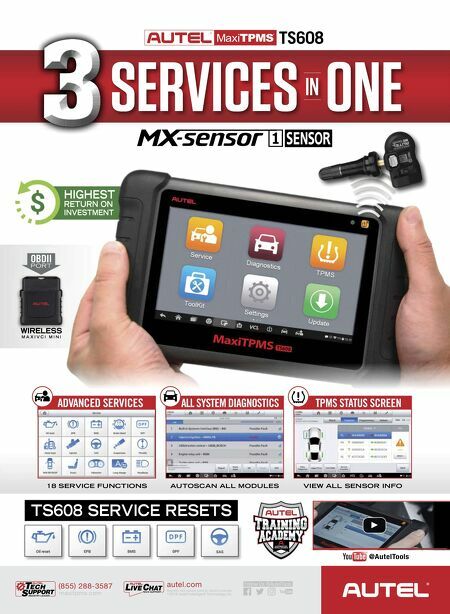 M T D N o v e m b e r 2 0 1 8 16 N e w s / V i e w s Nov. 27-30 Tire Industry Association Commercial Tire Service CTS-400 Instructor Training and Certification, Crowne Plaza Chicago SW – Burr Ridge, Burr Ridge, Ill. (800) 876-8372 www.tireindustry.org Nov. 29 - Dec. 2 Automechanika Shanghai, National Exhibi- tion and Convention Center, Puxi, Shanghai, Hong Kong www.automechanika-shanghai. hk.messefrankfurt.com January 19-26, 2019 Ontario Tire Dealers Association Winter Conference, UNICO Hotel Riviera Maya, Quintana Roo, Mexico (888) 207-9059 www.otda.com Feb. 20-23, 2019 Tire Industry Association Annual Off-the- Road Tire Conference, Saddlebrook Resort, Tampa, Fla. (800) 876-8372 www.tireindustry.org March 8-9, 2019 North Carolina Tire Dealers Association Expo, Raleigh Convention Center/Marriott City Center, Raleigh, N.C. (877) 784-0111 www.nctda.com April 12-13, 2019 Virginia Automotive Association Convention & Trade Show, Hilton Norfolk The Main, Norfolk, Va. (804 739-1400 www.vaauto.org July 26-28, 2019 Georgia Tire Dealers & Retreaders As- sociation annual Conference, Omni Hotels & Resorts, Amelia Island Plantation, Amelia Island, Fla. (770) 947-2323 www.gtdra.com November 5-8, 2019 Automotive Aftermarket Industry Week (including AAPEX, the SEMA Show and TIA's Global Tire Expo) Las Vegas, Nev. (800) 876-8372 www.tireindustry.org Dates L.A. tire dealer Arnie Sperling dies at 74 A rnie Sperling, a longtime Los Angeles tire dealer who was instrumental in the formation of the Independent Tire Dealers Group LLC (ITDG) as a founding shareholder, died on Oct. 2, 2018. He was 74. "One of good guys passed away Tuesday," said Barry Steinberg, owner of Direct Tire & Auto Service in Watertown, Mass. Sperling's family started Globe Tire Co. in 1932, and ran it for 37 years until Arnie and his brother, Stan, bought the business from their father in 1969. With the help of Jay Goldberg, they grew the business, now known as Globe Tire & Motorsports. ey opened Globe Tire & Automotive in Manhattan Beach in 1972, and purchased multiple other locations around Los Angeles and Orange counties. At one time, Globe Tire had 18 locations. Aer his brother and Goldberg retired, Arnie ran the stores. He sold the last two outlets close to one year ago. Many of Sperling's tire and wheel customers were athletes from the Los Angeles Lakers, Los Angeles Dodgers and other professional sports teams. "A rumor has it that even some Boston Celtics players would shop at Globe Tire!" says Chris Barry, senior sales director for ITDG. Sperling was also active in the California Tire Dealers Association. Survivors include his wife of 49 years, Lynn, "and a circle of close-knit uncles, aunts and cousins who adored him and were dearly loved in return," according to his obituary. 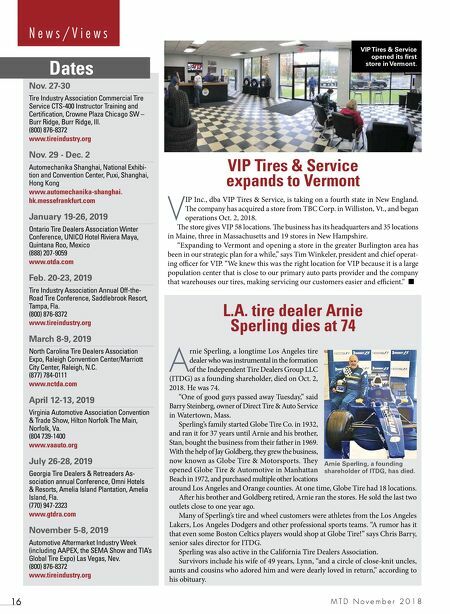 VIP Tires & Service expands to Vermont V IP Inc., dba VIP Tires & Service, is taking on a fourth state in New England. e company has acquired a store from TBC Corp. in Williston, Vt., and began operations Oct. 2, 2018. e store gives VIP 58 locations. e business has its headquarters and 35 locations in Maine, three in Massachusetts and 19 stores in New Hampshire. "Expanding to Vermont and opening a store in the greater Burlington area has been in our strategic plan for a while," says Tim Winkeler, president and chief operat- ing officer for VIP. "We knew this was the right location for VIP because it is a large population center that is close to our primary auto parts provider and the company that warehouses our tires, making servicing our customers easier and efficient." ■ VIP Tires & Service opened its first store in Vermont. Arnie Sperling, a founding shareholder of ITDG, has died.